UFC 234 this Sunday! 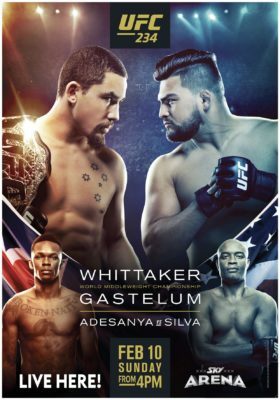 The middleweight title will be on the line in Melbourne, as Australia’s own Robert Whittaker defends his crown for the first time on home soil against Kelvin Gastelum in the main event. We will also have a $6 bottled beer & cider promo running all day including exciting names like Corona, Peroni, Tiger crystal, Somersby blackberry & pear along with many more.Prelims Live from 2pm.To reserve a table please call us on 034092178. Tables limited.